This article is about the plant and rhizome used as a spice. For other uses, see Turmeric (disambiguation). "Haridra" redirects here. For the river in India, see Haridra River. Turmeric (Curcuma longa; /ˈtɜːrmərɪk/ or variously /ˈtjuːmərɪk/) is a flowering plant of the ginger family, Zingiberaceae, the roots of which are used in cooking. The plant is rhizomatous, herbaceous, and perennial, and is native to the Indian subcontinent and Southeast Asia, and requires temperatures between 20 and 30 °C (68 and 86 °F) and a considerable amount of annual rainfall to thrive. Plants are gathered each year for their rhizomes, some for propagation in the following season and some for consumption. When not used fresh, the rhizomes are boiled in water for about 30–45 minutes and then dried in hot ovens, after which they are ground into a deep orange-yellow powder commonly used as a coloring and flavoring agent in many Asian cuisines, especially for curries, as well as for dyeing. Turmeric powder has a warm, bitter, black pepper-like flavor and earthy, mustard-like aroma. Although long used in Ayurvedic medicine, where it is also known as haridra, no high-quality clinical evidence exists for use of turmeric or its constituent, curcumin, as a therapy. Turmeric has been used in Asia for thousands of years and is a major part of Ayurveda, Siddha medicine, traditional Chinese medicine, Unani, and the animistic rituals of Austronesian peoples. It was first used as a dye, and then later for its supposed properties in folk medicine. Although the precise origin of turmeric is not known, it appears to have originated from tropical Southeast Asia. It is most associated with India today. The greatest diversity of Curcuma species by number alone is in India, at around 40 to 45 species. Thailand has a comparable 30 to 40 species for example, but is much smaller than India. Other countries in tropical Asia also have numerous wild species of Curcuma. Recent studies have also shown that the taxonomy of Curcuma longa is problematic, with only the specimens from South India being identifiable as C. longa. The phylogeny, relationships, intraspecific and interspecific variation, and even identity of other species and cultivars in other parts of the world still need to be established and validated. Various species currently utilized and sold as "turmeric" in other parts of Asia have been shown to belong to several physically similar taxa, with overlapping local names. Furthermore, in the case of the use and spread of turmeric by the Austronesian peoples into Oceania and Madagascar, there is strong linguistic and circumstantial evidence that it pre-dated contact with India. The populations in Polynesia and Micronesia, in particular, never came into contact with India, but use turmeric widely for both food and dye. Thus independent domestication events are also likely. The origin of the name is Indian. It possibly derives from Middle English or Early Modern English as turmeryte or tarmaret. It may be of Latin origin, terra merita ("meritorious earth"). The name of the genus, Curcuma, is derived from the Sanskrit kuṅkuma, referring to both turmeric and saffron, used in India since ancient times. Turmeric is a perennial herbaceous plant that reaches up to 1 m (3 ft 3 in) tall. Highly branched, yellow to orange, cylindrical, aromatic rhizomes are found. The leaves are alternate and arranged in two rows. They are divided into leaf sheath, petiole, and leaf blade. From the leaf sheaths, a false stem is formed. The petiole is 50 to 115 cm (20–45 in) long. The simple leaf blades are usually 76 to 115 cm (30–45 in) long and rarely up to 230 cm (91 in). They have a width of 38 to 45 cm (15 to 18 in) and are oblong to elliptical, narrowing at the tip. At the top of the inflorescence, stem bracts are present on which no flowers occur; these are white to green and sometimes tinged reddish-purple, and the upper ends are tapered. The hermaphrodite flowers are zygomorphic and threefold. The three sepals are 0.8 to 1.2 cm (0.3 to 0.5 in) long, fused, and white, and have fluffy hairs; the three calyx teeth are unequal. The three bright-yellow petals are fused into a corolla tube up to 3 cm (1.2 in) long. The three corolla lobes have a length of 1.0 to 1.5 cm (0.4–0.6 in) and are triangular with soft-spiny upper ends. While the average corolla lobe is larger than the two lateral, only the median stamen of the inner circle is fertile. The dust bag is spurred at its base. All other stamens are converted to staminodes. The outer staminodes are shorter than the labellum. The labellum is yellowish, with a yellow ribbon in its center and it is obovate, with a length from 1.2 to 2.0 cm (0.5 to 0.8 in). Three carpels are under a constant, trilobed ovary adherent, which is sparsely hairy. The fruit capsule opens with three compartments. In East Asia, the flowering time is usually in August. Terminally on the false stem is an inflorescence stem, 12 to 20 cm (5 to 8 in) long, containing many flowers. The bracts are light green and ovate to oblong with a blunt upper end with a length of 3 to 5 cm (1.2 to 2.0 in). Turmeric powder is about 60–70% carbohydrates, 6–13% water, 6–8% protein, 5–10% fat, 3–7% dietary minerals, 3–7% essential oils, 2–7% dietary fiber, and 1–6% curcuminoids. Phytochemical components of turmeric include diarylheptanoids, a class including numerous curcuminoids, such as curcumin, demethoxycurcumin, and bisdemethoxycurcumin. Curcumin constitutes up to 3.14% of assayed commercial samples of turmeric powder (the average was 1.51%); curry powder contains much less (an average of 0.29%). Some 34 essential oils are present in turmeric, among which turmerone, germacrone, atlantone, and zingiberene are major constituents. Cleaning turmeric rhizomes with boiling water in Myanmar. Drying turmeric rhizomes in Myanmar. Turmeric is one of the key ingredients in many Asian dishes, imparting a mustard-like, earthy aroma and pungent, slightly bitter flavor to foods. It is used mostly in savory dishes, but also is used in some sweet dishes, such as the cake sfouf. In India, turmeric leaf is used to prepare special sweet dishes, patoleo, by layering rice flour and coconut-jaggery mixture on the leaf, then closing and steaming it in a special utensil (chondrõ). Most turmeric is used in the form of rhizome powder to impart a golden yellow color. It is used in many products such as canned beverages, baked products, dairy products, ice cream, yogurt, yellow cakes, orange juice, biscuits, popcorn color, cereals, sauces, and gelatin. It is a principal ingredient in curry powders. Although typically used in its dried, powdered form, turmeric also is used fresh, like ginger. It has numerous uses in East Asian recipes, such as pickle that contains large chunks of soft turmeric, made from fresh turmeric. Turmeric is used widely as a spice in South Asian and Middle Eastern cooking. Various Iranian khoresh dishes are started using onions caramelized in oil and turmeric, followed by other ingredients. The Moroccan spice mix ras el hanout typically includes turmeric. In South Africa, turmeric is used to give boiled white rice a golden color, known as geelrys (yellow rice) traditionally served with bobotie. In Vietnamese cuisine, turmeric powder is used to color and enhance the flavors of certain dishes, such as bánh xèo, bánh khọt, and mi quang. The staple Cambodian curry paste, kroeung, used in many dishes including amok, typically contains fresh turmeric. In Indonesia, turmeric leaves are used for Minang or Padang curry base of Sumatra, such as rendang, sate padang, and many other varieties. In Thailand, fresh turmeric rhizomes are used widely in many dishes, in particular in the southern Thai cuisine, such as yellow curry and turmeric soup. Turmeric is used in a hot drink called "turmeric latte" or "golden milk" that is made with milk, frequently coconut milk. The turmeric milk drink known as haldi doodh (haldi means turmeric in Hindi) is a South Asian recipe. Sold in the US and UK, the drink known as "golden mylk" uses nondairy milk and sweetener, and sometimes black pepper after the traditional recipe (which may also use ghee). Turmeric makes a poor fabric dye, as it is not very light fast, but is commonly used in Indian clothing, such as saris and Buddhist monks's robes. It is used to protect food products from sunlight (coded as E100 when used as a food additive). The oleoresin is used for oil-containing products. A curcumin and polysorbate solution or curcumin powder dissolved in alcohol is used for water-containing products. Overcoloring, such as in pickles, relishes, and mustard, is sometimes used to compensate for fading. In combination with annatto (E160b), turmeric has been used to color cheeses, yogurt, dry mixes, salad dressings, winter butter, and margarine. Turmeric also is used to give a yellow color to some prepared mustards, canned chicken broths, and other foods (often as a much cheaper replacement for saffron). Turmeric paper, also called curcuma paper or in German literature, Curcumapapier, is paper steeped in a tincture of turmeric and allowed to dry. It is used in chemical analysis as an indicator for acidity and alkalinity. The paper is yellow in acidic and neutral solutions and turns brown to reddish-brown in alkaline solutions, with transition between pH of 7.4 and 9.2. Turmeric grows wild in the forests of South and Southeast Asia, where it is collected for use in Indian traditional medicine (Siddha or Ayurveda). In Eastern India, the plant is used as one of the nine components of navapatrika along with young plantain or banana plant, taro leaves, barley (jayanti), wood apple (bilva), pomegranate (darimba), asoka, manaka (Arum), or manakochu, and rice paddy. 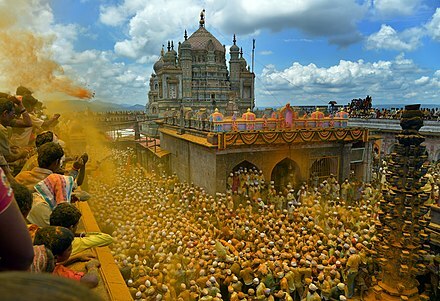 The Haldi ceremony (called gaye holud in Bengal) (literally "yellow on the body") is a ceremony observed during Hindu and South Asian Muslim wedding celebrations in many parts of India, including Bengal, Punjab, Maharashtra, and Gujarat, and in Pakistan. In Tamil Nadu and Andhra Pradesh, as a part of the Tamil–Telugu marriage ritual, dried turmeric tuber tied with string is used to create a Thali necklace, the equivalent of marriage rings in western cultures. In western and coastal India, during weddings of the Marathi and Konkani people, Kannada Brahmins, turmeric tubers are tied with strings by the couple to their wrists during a ceremony, Kankanabandhana. Friedrich Ratzel reported in The History of Mankind during 1896, that in Micronesia, turmeric powder was applied for embellishment of body, clothing, utensils, and ceremonial uses. As turmeric and other spices are commonly sold by weight, the potential exists for powders of toxic, cheaper agents with a similar color to be added, such as lead(II,IV) oxide, giving turmeric an orange-red color instead of its native gold-yellow. Another common adulterant in turmeric, metanil yellow (also known as acid yellow 36), is considered an illegal dye for use in foods by the British Food Standards Agency. Turmeric and curcumin, one of its constituents, have been studied in numerous clinical trials for various human diseases and conditions, but the conclusions have either been uncertain or negative. Claims that curcumin in turmeric may help to reduce inflammation remain unproven as of 2017. ^ "Curcuma longa L." Plants of the World Online, Kew Science, Kew Gardens, Royal Botanic Gardens, Kew, England. 2018. Retrieved 26 March 2018. ^ "Turmeric (pronunciation)". Merriam-Webster Dictionary. 2015. ^ Priyadarsini, KI (2014). "The chemistry of curcumin: from extraction to therapeutic agent". Molecules. 19 (12): 20091–112. doi:10.3390/molecules191220091. PMID 25470276. ^ "Turmeric processing". Kerala Agricultural University, Kerala, India. 2013. Retrieved 10 October 2015. ^ a b c d "Turmeric". Drugs.com. 2009. Retrieved 24 August 2017. ^ a b c d Brennan, J (15 October 2008). "Turmeric". Lifestyle. The National. Retrieved 13 May 2012. ^ Peter, K. V. (2008). Underutilized and Underexploited Horticultural Crops, Volume 2. New India Publishing. p. 341. ISBN 9788189422691. Retrieved 6 November 2018. ^ a b "Turmeric". National Center for Complementary and Integrative Health (NCCIH). National Center for Complementary and Integrative Health (NCCIH). March 2007. Retrieved 31 January 2017. ^ Chattopadhyay I, Kaushik B, Uday B, Ranajit KB (2004). "Turmeric and curcumin: Biological actions and medicinal applications" (PDF). Current Science. 87 (1): 44–53. ISSN 0011-3891. Retrieved 16 March 2013. ^ a b Kikusawa, Ritsuko; Reid, Lawrence A. (2007). "Proto who utilized turmeric, and how?". In Siegel, Jeff; Lynch, John; Eades, Diana (eds.). Language Description, History and Development: Linguistic indulgence in memory of Terry Crowley (PDF). John Benjamins Publishing Company. pp. 339–352. ISBN 9789027292940. ^ a b McClatchey, W. (1993). "Traditional use of Curcuma longa (Zingiberaceae) in Rotuma". Economic Botany. 47 (3): 291–296. doi:10.1007/bf02862297. ^ "Herbs at a Glance: Turmeric, Science & Safety". National Center for Complementary and Integrative Health (NCCIH), National Institutes of Health. 2012. Retrieved 11 October 2012. ^ LEONG-ŠKORNIČKOVÁ, JANA; ŠÍDA, OTAKAR; WIJESUNDARA, SIRIL; MARHOLD, KAROL (May 2008). "On the identity of turmeric: the typification of Curcuma longa L. (Zingiberaceae)". Botanical Journal of the Linnean Society. 157 (1): 37–46. doi:10.1111/j.1095-8339.2008.00788.x. ^ Nair, K.P. Prabhakaran (2013). The Agronomy and Economy of Turmeric and Ginger: The Invaluable Medicinal Spice Crops. Newnes. pp. 7–10. ISBN 9780123948243. ^ "Turmeric". Unabridged Random House Dictionary. Dictionary.com. 2013. Retrieved 11 October 2012. ^ Tawney, C. H. (1924). The Ocean of Story, chapter 104. p. 13. ^ Grieve, M. "Turmeric". botanical.com. Retrieved 14 April 2017. ^ "Curcuma longa Linn". efloras.org. Flora of China, South China Botanical Garden. Retrieved 30 November 2013. ^ Siewek, F (2013). Exotische Gewürze Herkunft Verwendung Inhaltsstoffe (in German). Springer-Verlag. p. 72. ISBN 978-3-0348-5239-5. ^ "Kurkuma kaufen in Ihrem" (in German). Archived from the original on 19 November 2016. Retrieved 20 November 2016. ^ Hänsel, Rudolf; Keller, Konstantin; Rimpler, Horst; Schneider, Gerhard, eds. (2013). Drogen A-D (in German). Springer-Verlag. p. 1085. ISBN 978-3-642-58087-1. ^ Tayyem RF, Heath DD, Al-Delaimy WK, Rock CL (2006). "Curcumin content of turmeric and curry powders". Nutr Cancer. 55 (2): 126–131. doi:10.1207/s15327914nc5502_2. PMID 17044766. ^ Hong, SL; Lee, G. S; Syed Abdul Rahman, SN; Ahmed Hamdi, OA; Awang, K; Aznam Nugroho, N; Abd Malek, SN (2014). "Essential Oil Content of the Rhizome of Curcuma purpurascens Bl. (Temu Tis) and Its Antiproliferative Effect on Selected Human Carcinoma Cell Lines". The Scientific World Journal. 2014: 1–7. doi:10.1155/2014/397430. PMC 4142718. PMID 25177723. ^ Hu, Y; Kong, W; Yang, X; Xie, L; Wen, J; Yang, M (2014). "GC-MS combined with chemometric techniques for the quality control and original discrimination of Curcumae longae rhizome: Analysis of essential oils". Journal of Separation Science. 37 (4): 404–11. doi:10.1002/jssc.201301102. PMID 24311554. ^ Braga, ME; Leal, PF; Carvalho, JE; Meireles, MA (2003). "Comparison of yield, composition, and antioxidant activity of turmeric (Curcuma longa L.) extracts obtained using various techniques". Journal of Agricultural and Food Chemistry. 51 (22): 6604–11. doi:10.1021/jf0345550. PMID 14558784. ^ a b Imtiaz, Sabia (11 May 2016). "Turmeric latte: the 'golden milk' with a cult following". The Guardian. Retrieved 7 January 2018. ^ "E100: Curcumin". UKfoodguide.net. Retrieved 14 April 2017. ^ NIIR Board of Consultants & Engineers (2006). Complete book on spices & condiments : (with cultivation, Processing & uses). Delhi: Asia Pacific Business Press. pp. 188–191. ISBN 9788178330389. ^ Ravindran, P. N., ed. (2007). 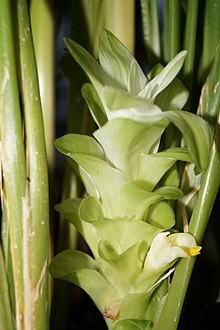 The genus Curcuma. Boca Raton, FL: Taylor & Francis. p. 244. ISBN 9781420006322. ^ Berger, S; Sicker, D (2009). Classics in Spectroscopy. Wiley & Sons. p. 208. ISBN 978-3-527-32516-0. ^ "A Bangladeshi Wedding Journal – Gaye Holud: Pre-Wedding Ceremony". The Daily Star. 11 November 2014. Retrieved 22 February 2017. ^ Singh K, S; Bhanu, BV (2004). People of India: Maharashtra, Volume 1. Popular Prakashan. p. 487. ISBN 9788179911006. ^ Ratzel, Friedrich (1896). The History of Mankind. London: MacMillan. ^ "Detention without physical examination of turmeric due to lead contamination". FDA.gov. US Food and Drug Administration. 3 December 2014. Retrieved 9 December 2015. ^ "Producing and distributing food – guidance: Chemicals in food: safety controls; Sudan dyes and industrial dyes not permitted in food". gov.uk. Food Standards Agency, UK Government. 8 October 2012. Retrieved 12 December 2015. ^ Daily, JW; Yang, M; Park, S (2016). "Efficacy of Turmeric Extracts and Curcumin for Alleviating the Symptoms of Joint Arthritis: A Systematic Review and Meta-Analysis of Randomized Clinical Trials". Journal of Medicinal Food. 19 (8): 717–29. doi:10.1089/jmf.2016.3705. PMC 5003001. PMID 27533649. ^ Vaughn, A. R.; Branum, A; Sivamani, RK (2016). "Effects of Turmeric (Curcuma longa) on Skin Health: A Systematic Review of the Clinical Evidence". Phytotherapy Research. 30 (8): 1243–64. doi:10.1002/ptr.5640. PMID 27213821. Wikimedia Commons has media related to Curcuma longa.